Summer holidays may be a distant memory already, but surely nothing stops you from dreaming and planning the next ones! 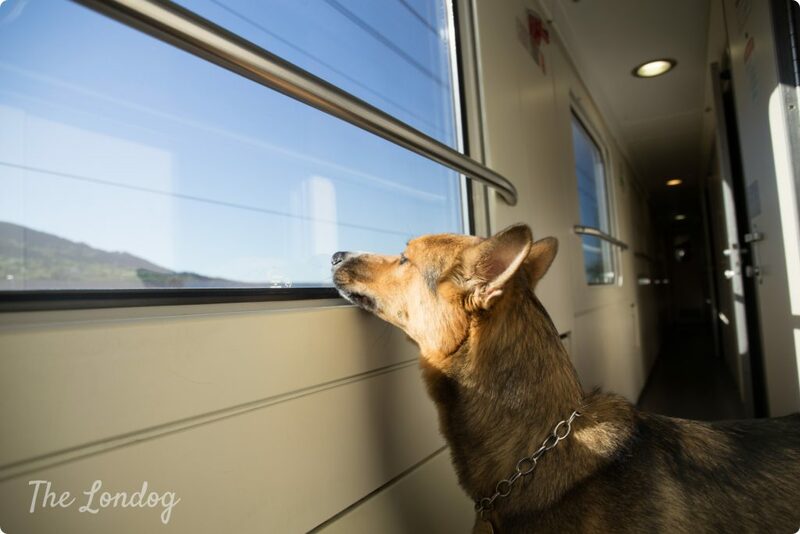 So why not taking inspiration from our 2017 dog train trip from London to Venice and Triest for your next dream vacation? If you are one of those persons for whom a holiday is not a proper one without taking your dog along, you will probably feel our choice to give up a quick and cheap plane journey, just to be include Argo in our vacation plan. In case you don’t own a car or you simply like using alternative means of transport, you will be aware that crossing the Channel on foot with a dog is not the most straightforward thing, considered that Eurostar doesn’t allow you carrying your pooch. But don’t despair! There are some good alternatives to get to Europe mainland. Exploring these, last year, me and Argo had gone on a solo adventure from London to Italy by train, which I recounted in our 7 things we learnt from our London to Venice dog train trip (see hyperlinked blog post) and provided all practical information of our trip (such as trains we took, hours, costs, etc.) in this blog post. Well, this year we made it again and finally did something I had been dreaming of… My husband joined us and we filmed our whole journey! So what did our trip look like? We condensed our 29 hours journey in a 5 minutes video: ENJOY! Take a friend/partner. As we suspected, travelling in 2 people rather than solo is quite handy. From going to the loo, to entering shops and making turns to carry the luggage. Go 1st class on the TGV from Calais Frethun to Paris. Especially if you have a large dog! This will give your dog much more room to lay down and stretch. We purchased our tickets with much advance and the price difference with a 2nd class ticket was very little. I believe Argo was very greatful he didn’t end up in a very tight and uncomfortable curl up between our feet like during the 2nd class TGV journey last year. Calais Frethun station has a public piano, so get ready to practice during the wait! 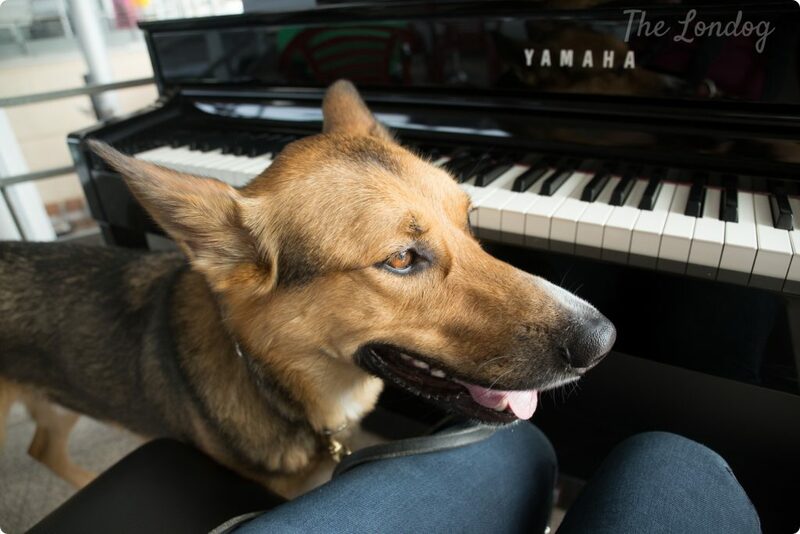 If your dog has a singing desire too, you may even put up a little show. Make the most out of your hours in Paris. You can make use of our Paris-chien Guide featuring out map of dog-friendly parks and applicable access restrictions – unfortunately many – and other essential information, and doing some researches about places to eat before going (we found a dog-friendly place but weren’t impressed, so no personal tips on that, sorry). If you decide to walk from Paris Gare du Nord to Paris Gare de Lyon, you can have a stroll around the lovely Le Marais district and Île Saint-Louis, see Notre Dame de Paris (from outside since dogs are not even allowed in the surrounding gardens), before having a walk along the riverbank parallel to Quai de la Tournelle and Quai Saint-Bernard. 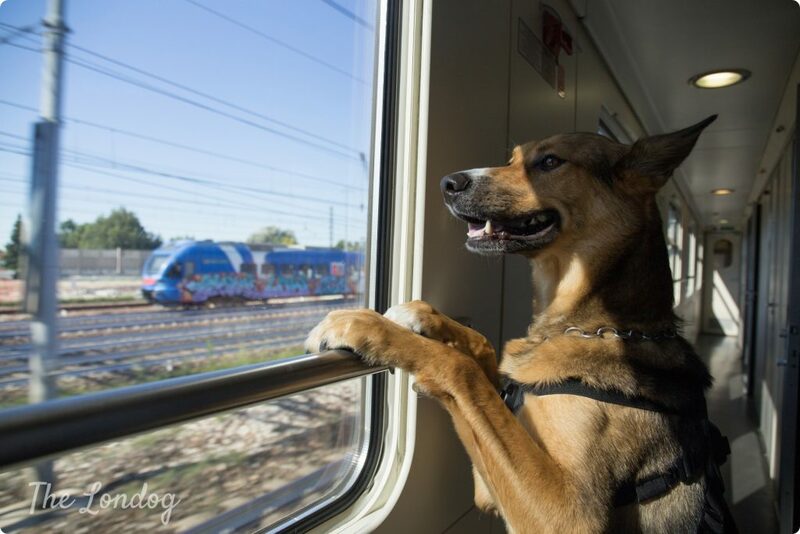 If you want to travel from the UK to a different destination in Europe mainland, I highly recommend The Man in Seat 61‘s website and in particular this page: it is an exhaustive resource for routes you may take to travel with a dog by train, which we found particulary helpful when deciding how to get from Paris to Italy last year. In case you have any questions, free to get in touch at any time! We will be happy to tell you more about the trip and help out where we can. We told you about ours, what was your latest adventure? your blog has been a great help and I am planning a journey based on your advice this summer. However, I cannot find a sleeper train for the return to paris , only the high speed TGV service. Can you advise ? i would preser he sleeper again if possible. Thank you for your advice, I would not of had the courage to undertake the trip without your blog and the man in seat 61! Many thanks for your comment and lovely to hear that you are planning a trip to Italy! I haven’t taken the train on the way back, but I have just checked Thello’s website and yes, there should be a train departing from Venice Mestre at 20:29 and arriving in Paris at 9:55 in the morning. I would advise you to check directly Thello’s website. 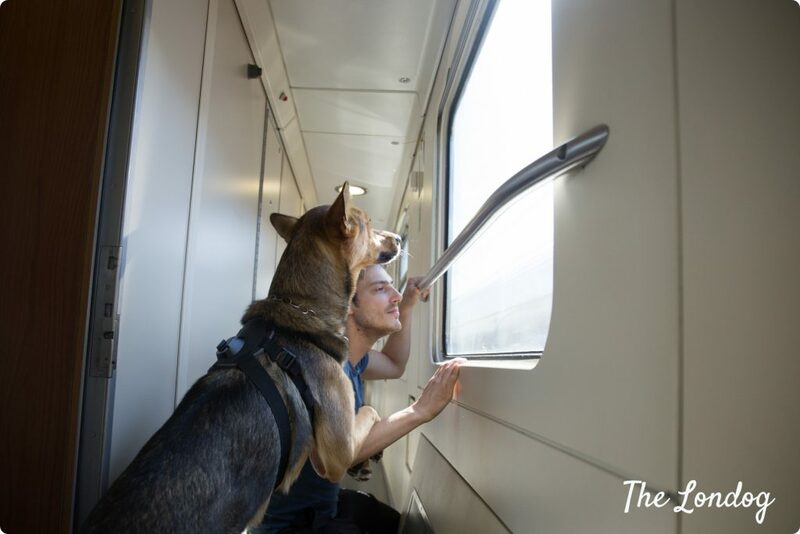 Good luck with your trip, send us a photo of your dog on the train! Thanks for this article. Argo is so adorable! We have a little white fluffy dog Chloe who is 14.5 years old and we love her to bits and take her on many driving trips around the UK. She also travelled in first class on Virgin trains from London to both Glasgow and Edinburgh. We would love to take her to Europe with us – but worry about having her locked up in the kennel. Your link to seat61 is very informative. We have taken Chloe to Northern Ireland & Ireland twice in the car with a ferry crossing from Cairnryan to Belfast – she was allowed to sit in her zipped up pram for the duration of the crossing with us. We love NI & Ireland. We have also taken Chloe to the Isle of Wight by ferry from Portsmouth three times in the car and done driving trips around the IoW – lovely sceneries. Wish one day Eurostar will see the benefits in allowing dogs from London to Paris. Hi Chloe’s mum, wow, these sound like great travels. Lovely that you brought Chloe so much around, she is very lucky! I hope your dream to take her to the continent comes true: there are so many awesome places to discover all around Europe! And regarding the Eurostar I hear you! In one of your replays, you said you didn’t come back by train. Did you take the plane? I live in London and I really want a dog, but I don’t want to leave a potential member of the family here in UK. I still don’t get why is soooo difficult to travel with dogs ?